I have given the blog a little makeover to go along with my shorter hair and started using the ever-popular “Mistylook” theme here on WordPress. While it seems that *everyone* is using it, I like its clean lines, fonts, and links, and it was just time for a little change here as well. The color scheme is very similar to the one before, though, so not all is completely different. I’d meant to keep my original header photo so that my blog would not look too different, but now I can’t find the photo I used for it. Eh, it’s somewhere. Instead, out of laziness at not wanting to hunt it down, I picked another photo which is of the belvedère from the Parc des Buttes Chaumont, and which was also a part of the original header photo I used. This week, I read another post by one of my most favorite “Mom Bloggers” in the world, Betsy Shaw. She posts on not only her personal blog Numbmum, but is also a long-time writer for the BabyCenter MOMformation website, posting under the blogname “Babe’s Blog.” A couple of the reasons I like Betsy’s blogs is that we are about the same age, have a youngest child born in the same week (early November 2005), and both live in France — Betsy and her family have been in rural Burgundy for about a year now (maybe just over that…). 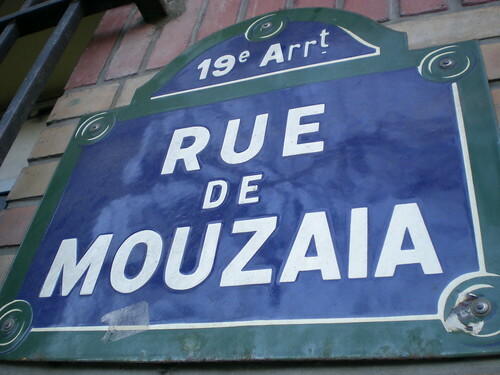 Because of something she wrote on her most recent post “Arranged Marriages and Angry Bedtime Stories,” I got inspired to write about something I have been meaning to for about three months now: An Adventure Along the Rue de Mouzaïa. It [Oliver’s playing the clarinet next door] makes life feel as rich and quirky and full of color as a children’s book. The way life should feel. “YES!” I thought, reading those lines. That IS the way life should feel! I also realized that the simile captured how I felt about the Rue de Mouzaïa and meeting Peter Olson of Peter’s Paris — like I was living in a children’s book, where life is rich, quirky, and full of color. Tucked away in the middle of the 19th arrondissement, nestled in the center of Métro line 7 bis, is an area of streets containing charming late-19th Century row houses, designed (mostly) by French architect Paul Casimir Fouquiau. On a very chilly December 14 (2009) Monday morning, Peter Olson of Peter’s Paris and I met to check out this off-the-beaten-path area of the 19th in Paris and see what we could trouver. 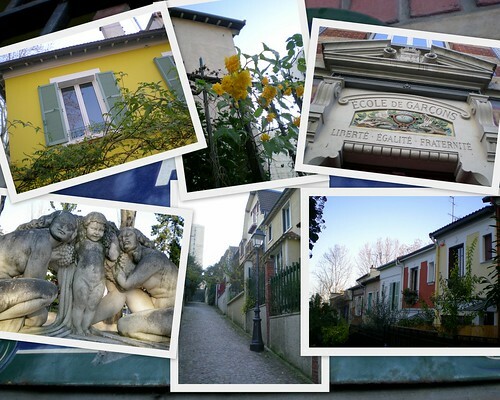 I like the French verb “trouver,” to find; it makes me think of treasure troves, mysteries solved, and discoveries made. Peter and I found some unique things on our journey that day, including the discovery of common interests and friendship. Keep reading to trouver for yourself about what we found.